Democratic vice presidential candidate Joe Biden accused Republicans of employing "scurrilous" campaign tactics and urged supporters not to be distracted from the economic issues affecting their lives. Biden pointed to automated phone calls sent to voters in key swing states by Republican John McCain's campaign. The calls attempt to link Democrat Barack Obama to former '60s radical William Ayers. The calls assert Obama "worked closely with domestic terrorist" Ayers, though there is no evidence the Illinois senator and Ayers are close. "The Republican campaign has stepped up its attacks," Biden told a crowd of 3,800 at an evening rally in the Las Vegas suburbs. "You may have heard about the scurrilous phone calls that are coming into homes - in Nevada and in New Mexico, where I was, and in Virginia, where I'm going - that question Barack Obama's character and by implication question his patriotism." "They don't hurt Barack Obama. They don't hurt me. But they hurt the American people because they're an attempt to distract you from the issues that matter to your daily lives." The McCain campaign has defended the calls, saying the association between Ayers and Obama raises question about the Democrat's judgment. At an earlier rally, in Mesilla, N.M., Biden took aim at a comment from rival Sarah Palin, in which she said she loves visiting "pro-America" parts of the country. Biden said he believed the whole country is patriotic. "Ladies and gentlemen, I have never been to a state that hasn't sent its sons and daughters to serve its country," Biden said in Mesilla as the crowd of about 2,000 booed Palin's reported comments. "It doesn't matter where you live, we all love this country. And I hope it gets through that one of the reasons why Barack (Obama) and I are running is that we know how damaging the policy of division ... has been. 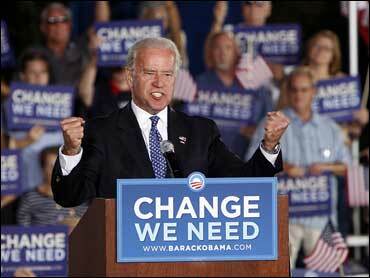 "We are one nation, under God, indivisible," Biden shouted to the crowd. "We are all patriotic, we all love this country." According to published reports, Palin told a North Carolina fundraiser Thursday that the best of America was not in Washington, D.C., but in small towns like the one in Alaska where she served as mayor. The Delaware senator focused his remarks Friday on the working-class issues that have been the foundation of his appeal. In Nevada, he spoke in a city park in Henderson, an older first-ring suburb of Las Vegas. The area has been roughed up by the collapse of the housing market. An impassioned and animated Biden, promised to rebuild the middle class, reform health care and put a temporary moratorium on home foreclosures. His emotional and loud appeal was a stark contrast from his description of this running mate. "Barack is going to have his hands full. But Barack is put together and, by the way, they are steady hands, you watch him," he said. "You saw how steady he is in those debates. This is man who has equanimity. This is man who not only is really bright, but he has the temperament for the moment." McCain spokesman Rick Gorka called Biden speech "bombastic and spiteful." "It's unfortunate that Biden used this unique opportunity to champion the protectionist, higher tax policies of Herbert Hoover instead of offering constructive solutions to help hurting Nevadans," Gorka said.